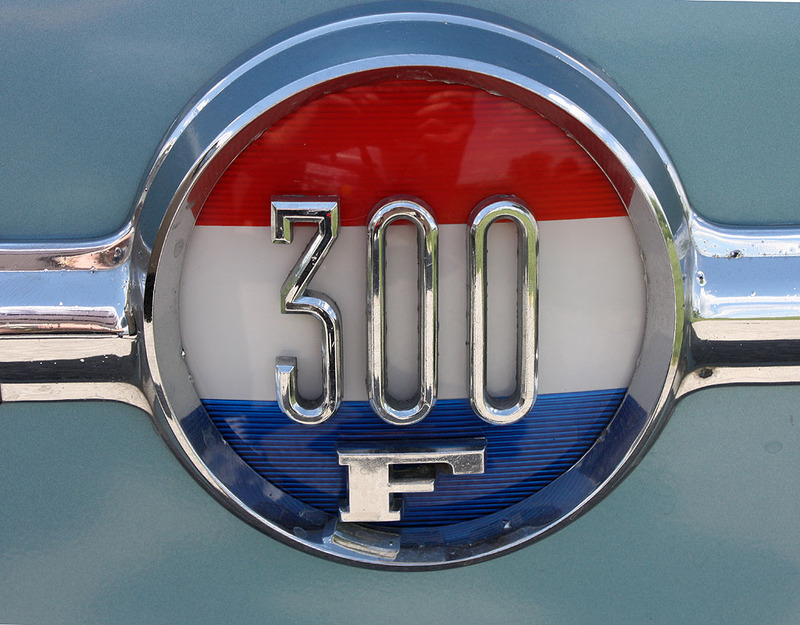 This 300F began life on or about 3/10/60 and was delivered new to Fischer Record dealer in Grosse Pointe, Michigan. My wife Carolyn and I first met the “Blue F” on a visit to Dennis Wahling in April of 1979, while enroute to a wedding in Omaha, Nebraska. We had stopped by to check out a K convert Dennis had for sale. 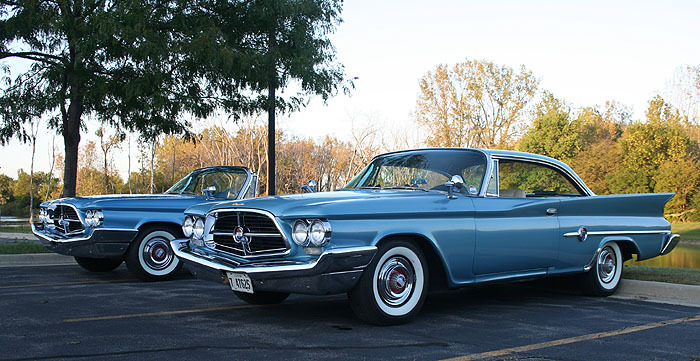 Dennis had quite a collection of 300s consisting of a parade green C, white C, white D, the K convert (which we bought that spring) and the Polar Blue F hardtop, the significance of the color was not fully realized at the time. We just liked blue! During the following months following the purchase of the K we made several other trips to Mr. Wahling’s. 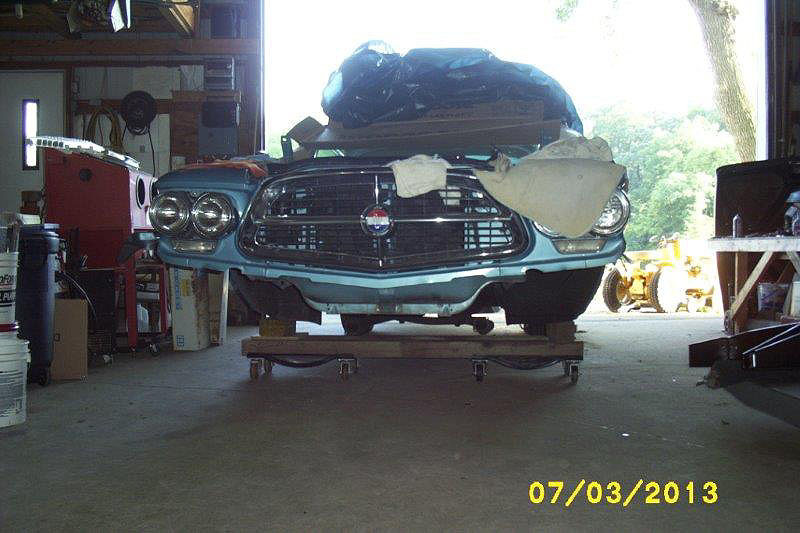 At the time, we were restoring a ’64 Newport convert and Dennis had located parts for us. It was during one of these visits that I expressed an interest in the F, as it was just sitting and it seemed as though Dennis had his hands full with a ’32 PB coupe as well as farming, etc. Later that fall a letter came, informing us that the F could be ours if we would like it. Needless to say we were overjoyed even though we had no place to put it at the time, much less funds for a restoration project of this magnitude. Arrangements were made to pick the car up early in December. Well, December means winter, and winter means snow and slick roads. Little did we know at the time but the combination of these factors was about to spell minor disaster! In the deal for this car was a tow bar, not just A tow bar, but a HOME MADE TOW BAR! One Saturday evening, during the last of December 1979, found us in Shelby, Iowa with the aforementioned F on the tow bar, with lights hooked up and ready to roll. Sunday AM, however, found 2” of fresh fallen snow added to the picture! Not to worry. Being a long-distance trucker, with untold thousands of miles under my wheels, I felt confident I could make the 300 or so mile trip with no problem…. Wrong! At the second left turn, the tow bar broke, sending the F jack-knifing into and under the rear of my 1-ton truck, breaking the grille and smashing the hood and fender!! Dennis made me the loan of his trailer at this time and we made the rest of the trip without incident. The car came with a broken windshield, no engine, one ram, no carbs or exhaust, and the transmission in the trunk. Boxes of parts and junk in the trunk yielded several goodies, such as the cast iron elbows for the exhaust, several extra medallions, broken chrome trim, rods, pistons, miscellaneous engine internals, and mouse droppings complete with accompanying stench and petrified remains! Body rust was minimal; the only major rot problem being in the trunk and driver’s floor pan where water had been sitting. 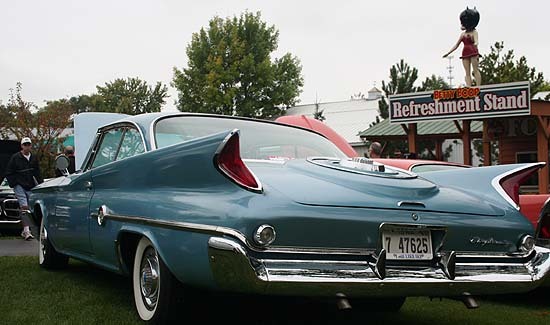 However, the right quarter panel was another story. Investigation revealed that the car had been a passenger on a fork lift in its recent past, with the quarter panel bearing the brunt of the damage. Needless to say it presented the biggest challenge to straighten, having been hit high by the window post. This also caught the right door as well as fork damage to the floor pan and frame extension. The interior was a complete disaster with mulched seat cushion material hanging from holes in the headliner having been placed there by the aforementioned mice in search of a home. 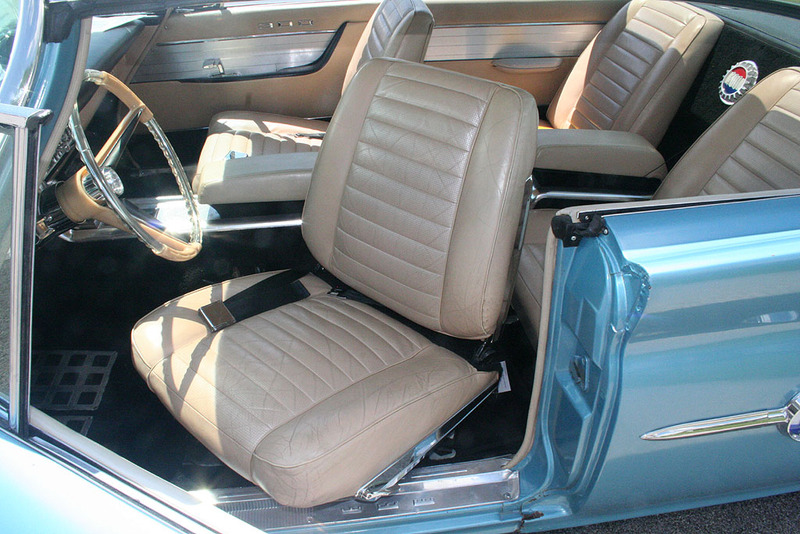 The seats were all dried and cracked, the chrome trim pitted and cruddy. But the radio, we later found out, played and the power windows went up and down, so we thought, what the heck, let’s do it! The following 5 years or so saw the usual parts hunting, dismantling, cleaning, etc. that we all know so well. Any of us who have gone through the restoration process can attest to this. It was during this time that the significance of the 999 paint code came to my attention. 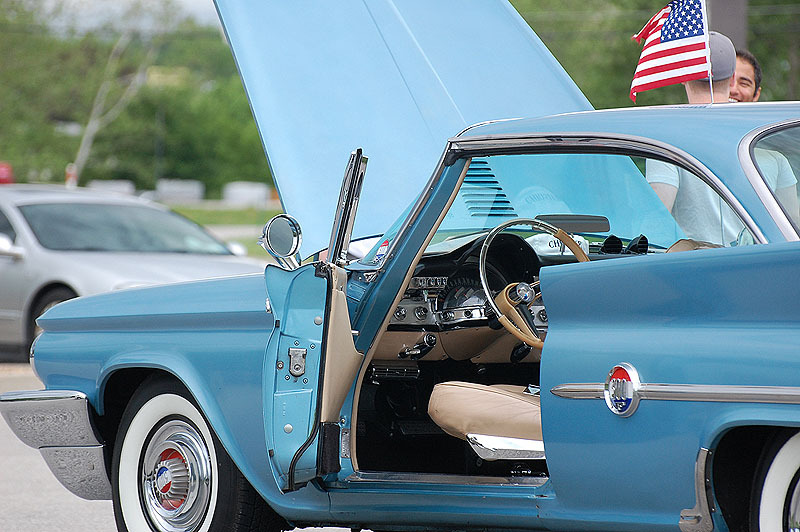 The car carried a “Polar Blue” paint color on it. Disassembly of the car did indeed reveal that it had been this way from the start. The discovery, under the floor mat of the rear seat area, of the “CHRYSLER SPECIAL CAR ORDER”(click to view) form which contained all the info needed to have a 300 painted a color other than stock, confirmed this fact. I assume from this that all 300s with 999 paint codes should yield forms such as this on their person….I mean body! This, I feel, would make for a great article or research project in and of itself. Along these lines, I invite any owners of 300s with 999 codes to check this out with their cars. If you should locate this form, make a copy and send it to the club or to myself, as I would like a collection of as many as possible of these. The form in our F was folded three times and sandwiched between the floor mats and the floor pan under the left rear seat. It was discolored somewhat from the undercoating, and rather fragile. The form carries the numbers 16708 and the date 2-56, both of which are located in the upper left corner of the form. 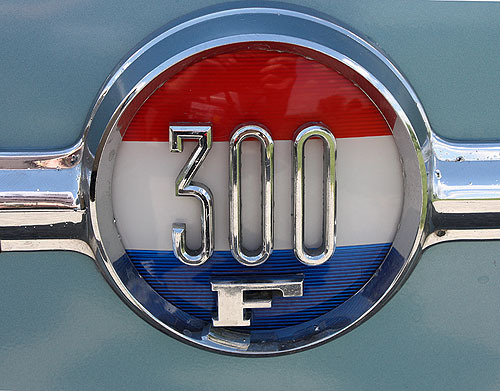 This leads one to believe this form may have been used since that date for any deviation from standard car specs, such as paint and or interior color in the case of the 300s. By the way, anyone wishing a copy of the form found in our car, please send a business size SASE to me and I’ll be glad to provide a copy. To make an already too long story short, 1986 saw the first breathe of life fire from the rams of the “Blue F” in what I estimate to have been at least 14 years. We have license records covering the period from 1962 to 1972, during which time the car had no less than 3 owners. 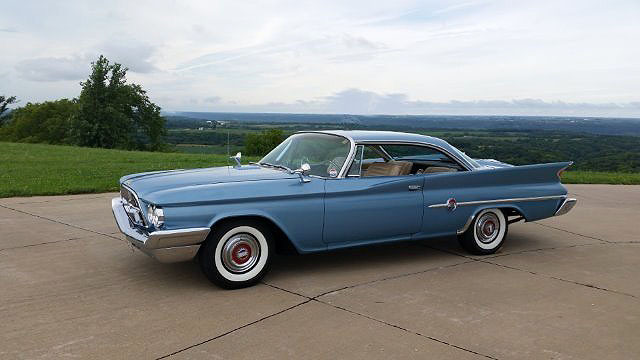 We recently spoke to a previous owner of this car who had the car from 1961-1966 and he was able to shed much light on the life and times of 8403141273, some of which I hope to share with you at a future date. We look forward to many miles of enjoyment from our 300F. Many thanks to the club members who had a hand in the restoration of this rare car, be it from parts purchase, research, or just plain old motivation, it all was welcome more than I can express. By the way, the remainder of the Dennis Wahling collection is also in our possession at this time. 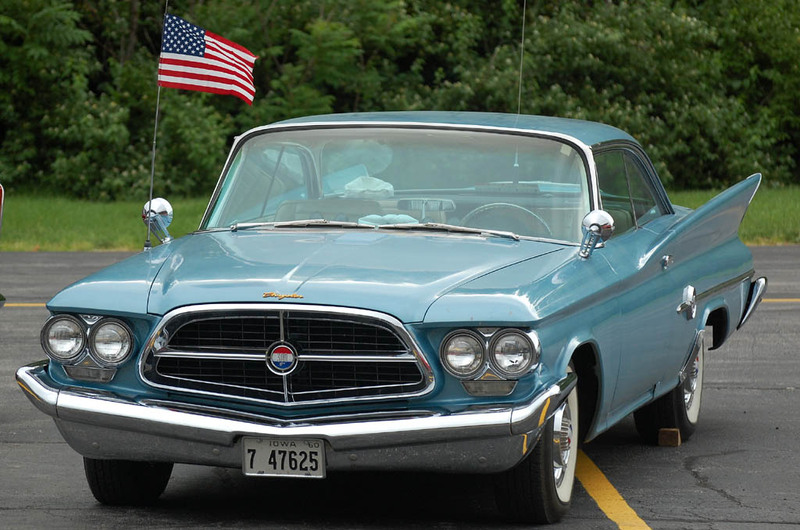 We hope to begin work on the Parade Green C hardtop in the not too distant future. On the way home from the St. Louis meet the F developed big time oil consumption and smoking! 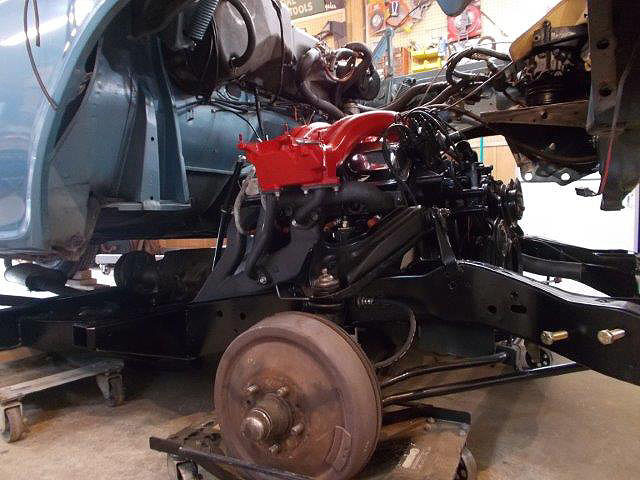 This engine has been together for 35,00 miles since 1985 with mileages in the 14-15 MPG range with an occasional 16 MPG run since the carbs were rebuilt last year by Jim McGowan. Once home we checked into the engine and found very low compression on #'s 3 & 4, compressions from 120 to 150 on the rest and some oil fouling on #8 but still ran strong!! Go figure. The initial tear down revealed more bad news. 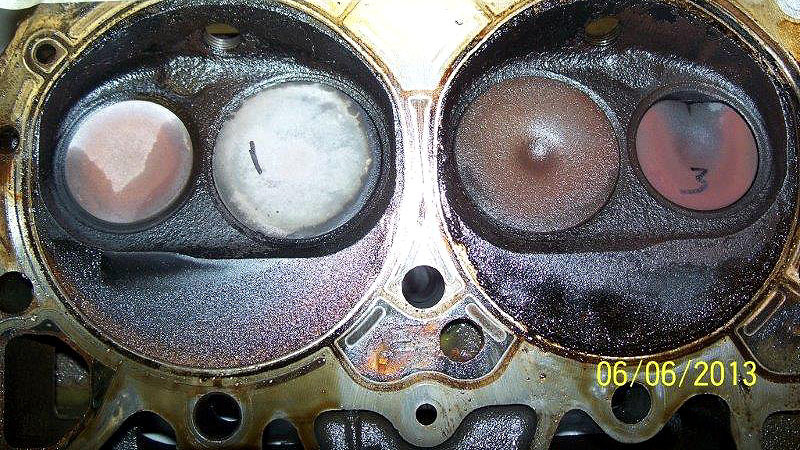 #4 has a badly burnt intake valve, but most of the rest, but for #8, look quite normal (I believe) with light brown to nearly white combustion chambers and plug tips. 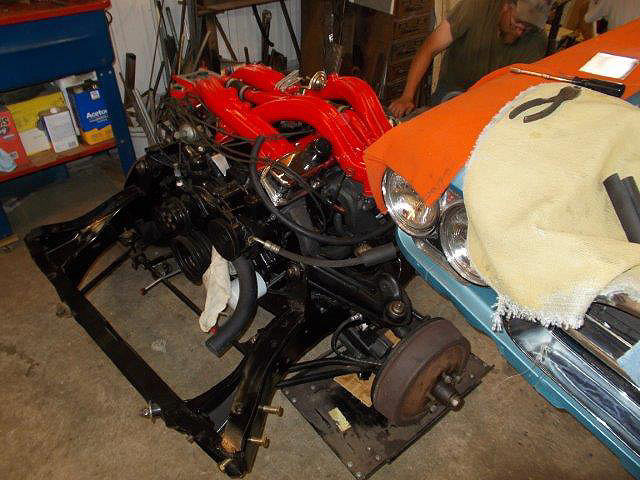 So the engine will come out for rebuild and we might as well tackle the frame too. Well, it's out with the old and in with the new, replacement frame that is! This car had been wrecked several times in the past before I got it and the frame was never able to be brought into 100% correct alignment. 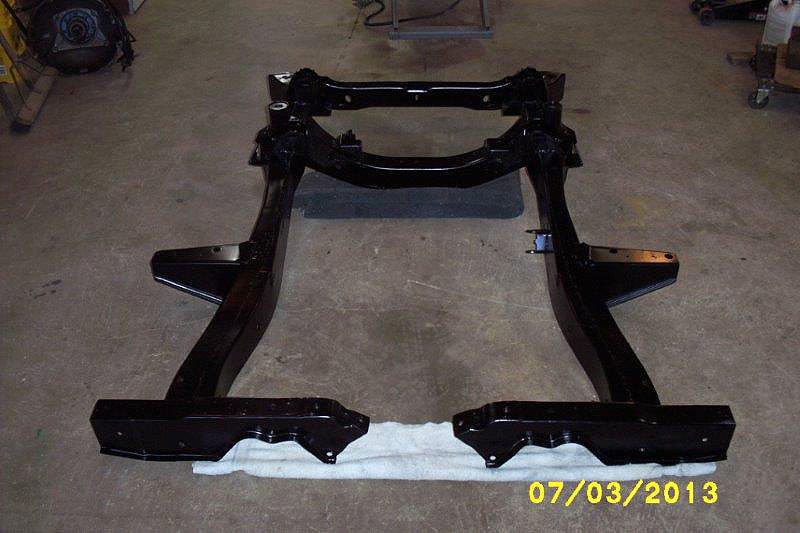 Plus the frame horns were all bent and mangled as well as the motor and sway bar mount nuts completely ripped from the frame. I got a replacement frame years ago from Dave Clelland, Thanks Dave! !, and had it blasted and painted so now is as good a chance I will ever get to replace it now the drivetrain is out! 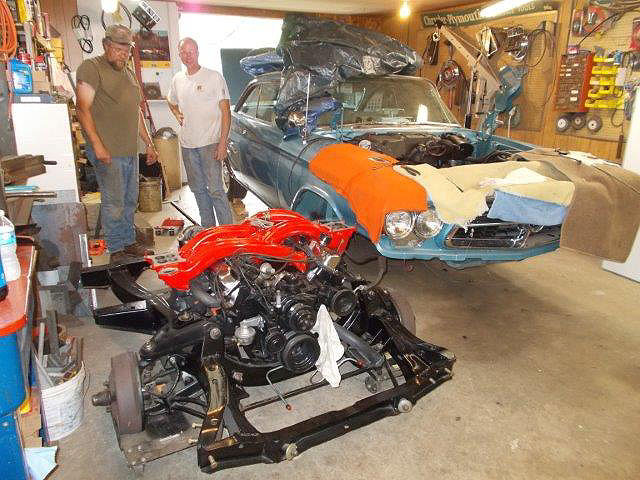 I got the motor out several weeks ago for tear down and yesterday Les and I got the frame/steer gear, front hubs and gear out from under her in one piece. The newer style sissors jacks work great for lifting the body off the frame what with the slotted lift part on top of 'em. It went pretty smooth once we got everything unhooked and out of the way. I put a 4 wheeled dolly under each end of the frame and were able to scoot it forward and turn the whole affair sideways a little so the steering sector would clear. 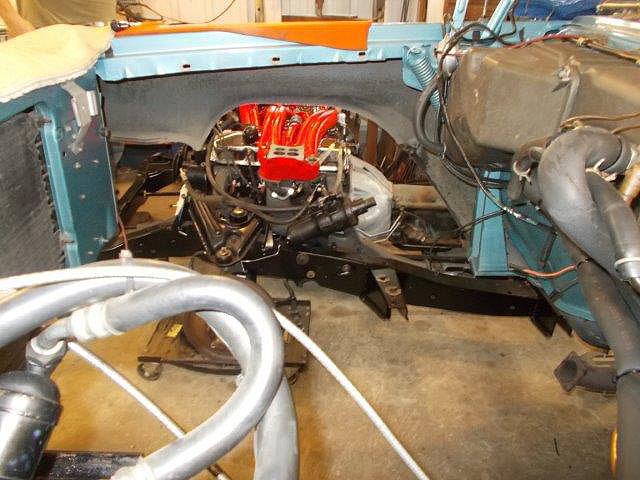 Then we could slide it out at an angle with the gear going under the fender liner wheel well opening. The only snag was one of the bolts that anchors the right front mount to the lower firewall broke so we will have to remove that liner and see what's up with that. So now, it's fill the parts washer with new fluid and start cleaning parts. 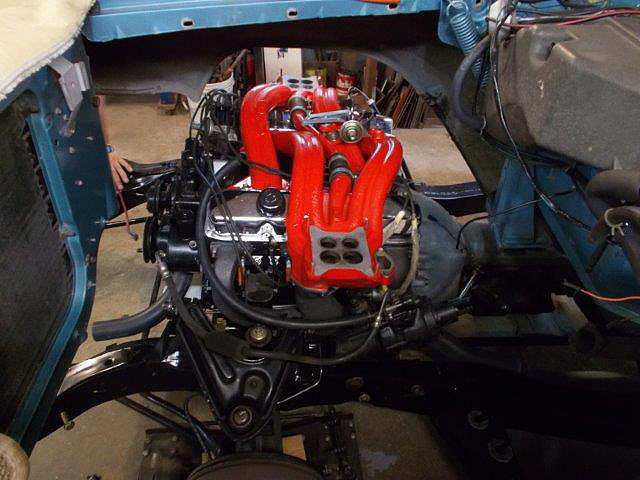 I am also going to install my freshly Steer 'N Gear rebuilt box and Booster Dewey brake unit. Just about ready to set back on the ground so I can button up the top end. Got to install the steering column yet. Brakes are bled, all frame bolts are torqued, driveshaft Is in place as is the exhaust. I'll be stiff and sore in the morning. Looks like an Ibuprofin nite for sure!! A very special thanks to Les and Russ, without whom this would never have seen the light of day probably.